It is an app and an e-book Salisedine, multimedia production quality for children 11 years and upwards. It has the traits of an illustrated story and a game, it propels us in a surreal post-disaster world (crystals salt have taken over the planet) with beautiful illustrations and a screenplay by praise, the protagonist is a brave young girl. The first episode, Salis Escapes is now available. 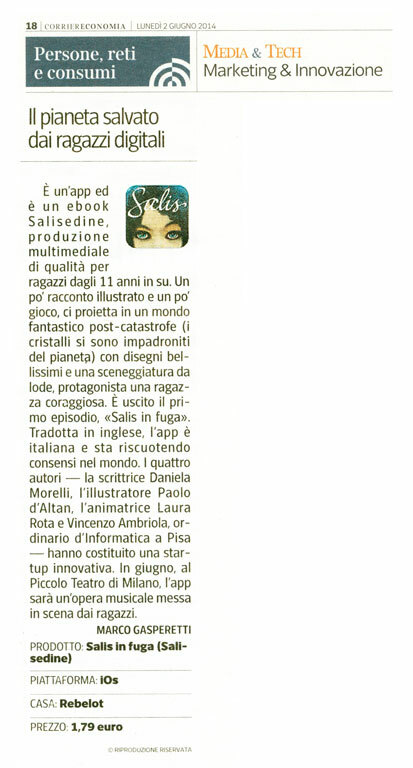 Translated in english, the App is made in Italy and is enjoying success in the world. The four authors – the writer Daniela Morelli, the illustrator Paolo d’Altan, the animator Laura Rota and Vincenzo Ambriola, professor of computer science at the University of Pisa – have created an innovative startup. In june, at Milan’s Piccolo Teatro, the app will be a musical staged by young guys.